Specifically designed to hold food heated to temperatures of up to 200 degrees Fahrenheit, this 1 quart bag will be the perfect addition for restaurants and catering companies who need to store prepared meals for prolonged periods of time. The zipper-style seal has an offset lip and triple ridges, making it easy to open. The seal also closes securely, retaining heat and keeping contents fresh. Made with virgin polyethylene resin, these bags have a thickness of 1.75 mil and meet USDA and FDA requirements for contact with food. Keep your establishment productive and efficient with the help of these quart bags! I needed an alternative to the expensive options. Webstaurantstore provided me with a cost savings alternate and was delivered in a timely manner. I'm very satisfied with this product. Good size, good quality, and great price bags. Easy to seal, and keep me organize. I can label the food using marker on them. Will definitely buy it again. Great Quality extremely strong zipper. Easy to use and store any kind of dry and wet goods. We use daily on our operations without any issue. I have used much more expensive bags and these hold up well. They are a little thinner than "name brands" but for the price difference, these do a fantastic job. Excellent quart sized bags. Never had any issue with the seal, and convenient white stripes for labeling and dating. Great for organizing small items to freeze as well. Great for small food and meal prep storage. It is not thin plastic, and seals very well. I've used them in the freezer too with no problems. The double white bars make proper labeling easy too. I love these bags. We use them for drizzling chocolate on our popcorn. They are very durable and seal great. Good quality at a good price. Two thumbs for this zip lock bags! They are of good quality and great in price. Does the job! We use it to freeze meat and chicken! They seal up nicely! And comes with two strips of area for labeling! And 500 comes in a pack! The dimensions are 7x8 which means this bag can accommodate pretty much any item found in the kitchen! 4 stars! We love these bags. they have a way of staying closed, maintaining what you write on it, and also keeping the food pretty fresh in fridges/freezers. These are good quality bags! Each bag has a large area for labeling. Each box contains 500, so you get a lot of bags for the price. Great quality seal too quart size bags that are very reasonably priced. You get 500 in a case and we couldn’t be more pleased with the quality. These work great for separating out individual portion servings for our chicken wings. Same bags that you would buy at a grocery store for much less! This is a great bag for all sorts of home and commercial needs. The white label is excellent for labeling to make sure that you can read in the freezer. Very solid standard weight ziploc bag. Much more economically priced than what you'd find at the big box stores and these come in a nice box for storage and have nice areas for writing labels. These bags are great! They ares a third of he cost of the glad brand and I love the fact that you have space to put names, and dates on them! I love these for freezing steak and other meat products. They are the perfect size for that. The white strips are handy and writing is easy to see on them . These bags are inexpensive and work exactly as described. We use them to store many different items and have already had the need to reorder them. These bags are of average quality. I really like the label strips on the front however I don't see where I'm saving a lot of money when I compare the price with other suppliers. This bags are really nice quality and leave the perfect amount of room to write item descriptions and dates. These come in handy for so many different things and we always stock up on them. Great bags. The seal on the top is creates a tight seal. And the 1 quart size is great for storing small amounts of food. The price is also great for 500 durable bags. Perfect medium sized seal bags. Price is just outstanding and quality too. It seals really well too. You will also appreciate two spaces for writing content and date. These quart bags are best for marinating meat. They are meant to be disposable, which makes clean up a breeze. This brand is cost efficient making it an ideal choice for kitchen necessities. These are great for our kitchen! We use them to freeze items such as stocks and also use them to portion up items. Good seal and price. Even with delivery the price at this web site is so much cheaper than our local supplier. The quality is great as well and makes portioning simple. Great value instead of buying store brands. Seals well and freezes well. The write-on white label is useful. Can buy large quantity of bags all at once! These quart size zip top bags are sturdy and seal very well. The dispensing box is very convenient as well. The section provided for labeling makes it so easy to identify the contents at a glance. I use these daily. I like the size and the fact that they are problem free. The zip locks are easy to use and hold together. While a bit pricey for standard portion controlled salads, this was a perfect bag for freezing vegetables to use for our dinner functions. Perfect for keeping product labeled and organized. Love this bag for splitting cases of produce or baking items. works OK in freezer, and certainly seals well for dry storage. definitely something that we have switched from name brand to this product. These bags are a great value. They work as well as the brand name bags without the hefty price tag. The white write-on strips is a huge plus as they help identify and track the contents without the expense of stick-on labels. These 1 quart zip lock bags work just as well or better than name brand bags for far less money, so the value is outstanding. The standard weight is thicker than most store brand bags, too. Great bag at a great price. I love buying in quantiy and these are perfect. They are easy to write on unlike other bags so if you need to mark products with dates these fit the bill. These are great bags for freezing leftovers. I put leftovers in these bags write what's in them and date it. That way if I'm not home from work and the family get's hungry, they thaw in hot water and microwave fir their dinner. Work's out great. 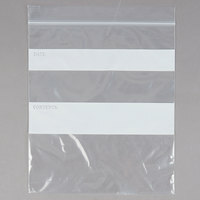 Awesome product.....looks and feels like the Ziploc bags, but less expensive. Locks tight and keeps food fresh, either in the refrigerator or the freezer. Would highly recommend.